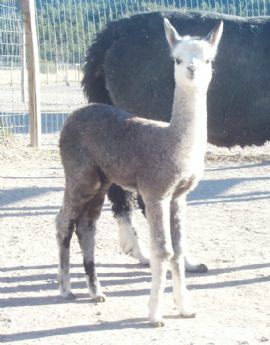 Willow is a stunning dark silver grey female out of Dom Lucilio and General Schwarzkopf bloodlines. She has perfect conformation as well as a wonderful presence. Her fiber is absolutely beautiful, showing uniform crimp, brilliant lustre, good handle and nice density. Willow will be a welcome addition to any breeding program to add color and the quality traits of her strong heritage. Willow sells with full ranch guarantees and a free breeding to any WMA male when mature.